It’s that time of year again, when our family room is full of boxes and the game table is covered with books. The signing is complete, but I still need to sketch in around 1500 books. 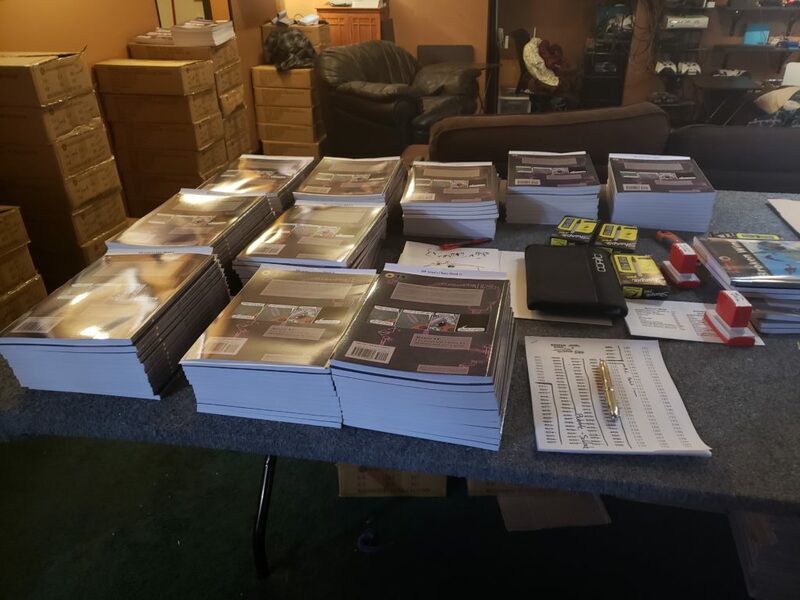 The sketching is complicated by the fact that we want to ship packages as soon as they come ready, and almost all of the sketched-book orders contain two books. Oh, and people get to choose which sketch they want, from a list of about a dozen for each book. I began with “Schlock in Bubble Armor” for book 14. There were 104 of those. When I finished them we could ship zero packages. I then sketched all 100 “Captain Landon” for Book 15, and at that point we could ship all of the packages which contained those two sketch editions. There were forty-three of them. Not bad! I moved on to the first batch of “Artist’s Choice” for Book 15. The overlap between that and bubble-armor Schlock was only 17. The overlap between that and Captain Landon was zero (because nobody ordered two copies of the same book) but now I have a table full of “Artist’s Choice” for Book 14, and the overlap is going to be around 80%. Which is to say, we would have shipped a lot more books sooner if I’d begun with Artist’s Choice for both Book 14 and Book 15. Sadly, neither Sandra nor I stopped to considered the Venn Diagram implications until after I was 100 books in. Stay in school, kids. STAY IN SCHOOL.